Unfortunately, Lake Karachay is probably best known for its radioactive waste pollution. Nuclear fission waste storage site in one of the Mayak facilities. Lake Karachay, located in southwest Chelyabinsk region in central Russia, is a spectacular place, with the southern Ural Mountains in its backdrop. However, the lake hosts a deadly secret that is apparently invisible to those concentrating on its beauty. The Lake Karachay is located within the limits of the Mayak Production Association, one of Russia’s largest nuclear facilities. 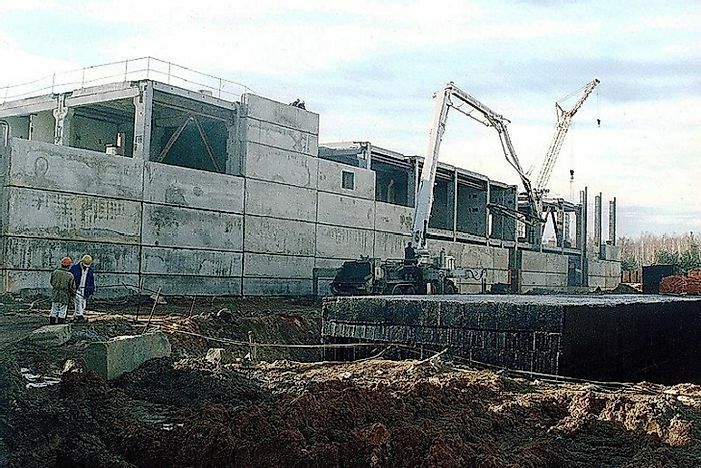 The facility, which was made completely inaccessible to foreigners for 45 years, had allegedly dumped large volumes of radioactive waste in the lake since 1951. In the 1990s, it was claimed that if an individual stood for only one hour on the shores of this lake, the radiation received would be enough to kill the individual via radioactive poisoning. The story of Lake Karachay and the Mayak plant reveals the disastrous consequences of mismanagement of radioactive wastes. In the backdrop of the Second World War, after witnessing the horrifying Nagasaki and Hiroshima bombings of Japan by the U.S., Russia decided to hastily stock up its own resources of atomic bombs. Between 1945 and 1948, the Mayak plant was established to generate plutonium for atomic bomb manufacture. Very little attention was paid to worker and environment safety during this period of time. While water from Lake Kyzyltash was used for cooling the reactors at the plant, the smaller Lake Karachay served as the dumping ground for nuclear waste since the underground vaults of the nuclear power plant were already overflowing with wastes. This practice continued till 1957, when, during the Kyshtym Disaster, the underground vaults of the power plant exploded and lethal levels of radioactivity spread to the surrounding. To hush up the matter and distract international media attention, the nuclear facility now started distributing its radioactive wastes over a larger area including other lakes and the Techa River. The heavy dumping of sediments also resulted in the gradual loss of water from the 1960s and, by 1993, the lake had significantly dried up, occupying only 0.15 square kilometers down from 0.5 square kilometers in 1951. Disaster again struck in 1968 when a severe drought in the area led to the dispersal of large volumes of radioactive dust by the wind from the lake area to the nearby settlements, irradiating around half a million people. The radioactive wastes deposited in Lake Karachay and surrounding grounds and water bodies comprise of a fatal cocktail of Strontium-90, Cesium-137, and other radioactive products with a long half-life. As per reports, nearly 5 million Curies of radionuclides have also polluted about 1 billion gallons of groundwater. Not only did the Lake Karachay generate 600 röntgens/hour but also the nearby Techa River was loaded with 120 million curies of radioactive materials. Nearly 65% of the residents residing near the contaminated site fell ill due to radiation sickness but doctors were not allowed to mention radiation in their prescriptions and instead had to mention the disease as "special disease”. Today, the Lake Karachay and its surrounding habitats are almost completely uninhabited. Of the fish and other aquatic species that survive there, all are considered to carry high levels of lethal radiation. Since anyone who arrives at the lake site is susceptible to receive lethal radioactive radiation, very few studies have been conducted at the site regarding its wild species and surviving flora and fauna. However, severe deformities in the region’s wildlife are expected to exist. The Lake Karachay has been declared the “most polluted spot on Earth” by the Worldwatch Institute. The lake is believed to be covered by 11 feet of sediment, this being composed almost entirely of radioactive wastes. The high levels of radioactive pollution existing in the area, in and around the lake, have given rise to alarming rates of cancer cases and birth defects in the Chelyabinsk region and its surroundings. There are reports claiming that the radioactivity has also spread to nearby rivers and streams and also contaminated the ground water. Large areas in Chelyabinsk are currently uninhabited because of the lethal conditions existing there. The large scale of the disaster makes it very difficult to initiate cleanup activities in the region. Too much damage is already done and the only way to manage the disaster is by restricting entry of people into the polluted area. The Lake Karachay disaster should be accepted as a lesson and future management of radioactive plants should involve careful planning and responsible action.